Picture this: You’re walking through an organic chemistry lab on NC State’s campus. You put on your safety goggles and follow the professor over to a whiteboard, checking out the equipment around you along the way. A pretty standard student experience, right? It would be, except for the fact that you’re actually sitting at your kitchen table in front of your laptop. Thanks to immersive technology experiences developed by DELTA (Distance Education and Learning Technology Applications), online students can receive all the benefits of being on campus — and, in many cases, even more. For instance, that chemistry lab whiteboard is actually a graphic that DELTA multimedia designers included to enhance the learning experience. It’s loaded with information that wouldn’t necessarily be available to students actually in the lab. Especially those stuck in the back of the group who might not be able to hear or see well. Immersive technology is not new, according to DELTA Creative Director Mike Cuales, but it’s taking off for education. Big time. Virtual reality technologies are more accessible and more dynamic than ever. There are all sorts of immersive technologies housed under the term “X Reality” or “XR” — augmented reality, mixed reality, virtual reality and more. It can be confusing, Cuales says, but they all point to the same end goal: placing users in a unique experience outside of their actual reality. Cuales and his team adapt these technologies for NC State faculty to use for instruction because “giving students a sense of presence and a sense of being is really important to learning,” he says. Like a kid in a candy store, he says tinkering is the fun part. “We have this augmented reality headset. … Stick your phone in this device and it projects an image through a mirror,” he says. “It has one purpose, which is to fight with a lightsaber, but maybe we can take it apart and build an instructional device through reverse engineering. The DELTA projects run the gamut of subject matter areas, and innovation is the name of the game. In one example, Cuales and the DELTA team scanned the entire five-story NC State Feed Mill with a camera system called Matterport to demonstrate to students how a feed mill is constructed. But the result ended up being much better than they’d imagined. 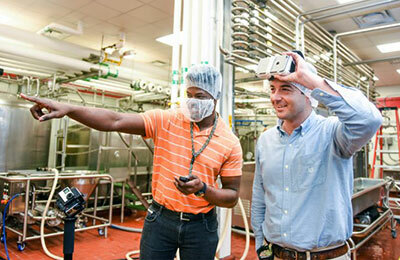 Clint Stevenson, right, an assistant professor in the Department of Food, Bioprocessing and Nutrition Sciences, is working with DELTA on a VR video project. Another early adopter of immersive technology is the Department of Food, Bioprocessing and Nutrition Sciences. Cuales and the DELTA team worked with Assistant Professor Clint Stevenson and his team to create virtual food processing facility environments. Designed to educate students and employees about food safety, the interactive 360 VR video will enable users to conduct an inspection with an NC State Extension agent, swabbing equipment and interacting with the environment as if they’re right there. In this case, creating virtual immersive content is just one piece of a larger puzzle, Cuales says. Accessibility is key, so many of Cuales’ projects don’t require fancy equipment and can be accessed through desktop, laptop or tablet. Of course, the experience is better with a headset, but the educational outcomes aren’t compromised without one. The sky’s the limit for immersive technology, Cuales says. He jokes about the blurring of the lines between reality and virtual reality, conjecturing that as the technology evolves, we might “live” in both realities in equal measure. Interested in getting in on the action? Check out the DELTA grants program, which provides opportunities for developing new courses that apply immersive technology. 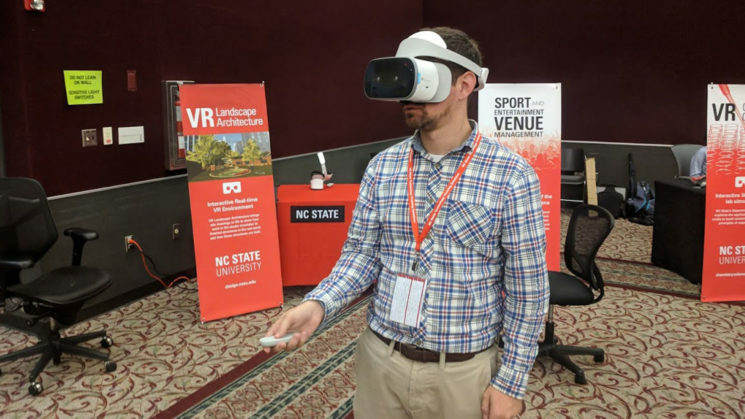 DELTA and NCSU Libraries also are hosting an Immersive Playground at D.H. Hill Library on Friday, Nov. 9, that invites visitors to explore all sorts of emerging technology.